With tweaks to the storytelling and the suspects in play, Gotham by Gaslight hits comparable, recognizable beats to those of the one-shot comic, yet arrives at different destinations that undercut -- and, in ways, overplay -- the intentions of this kind of Elseworlds story. While a few of the stories under that brand relish how perversely they twist the characters in strange directions, the enjoyment found in most of �em comes in seeing how familiar characters conduct themselves normally under different circumstances and limitations inherent in the setting. A substantial twist occurs here involving the identity of Jack the Ripper, bigger than that of the original comic, and it challenges that notion by warping established character temperaments and rules by which they abide, in service of novel shock value. While indeed shocking, the revelation also calls into question whether it fits with their pre-established presence in the books � and whether that matters. The Elseworlds label grants some freedom to the creative process, but this ends up being an outlandish alteration to a pillar of the Bat-verse. 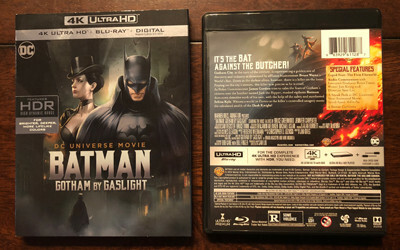 Batman: Gotham by Gaslight arrives from WB and DC in a fairly stock 4K UltraHD package, presented in a black double-disc case with moody artwork duplicated on both the cover artwork and the slightly shiny slipcase. 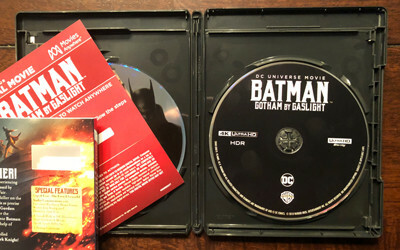 Inside, one will find a bare-bones, black-topped 4K disc alongside the standard Blu-ray as Disc Two, which features Batman's visage on the silver-and-green top. A Digital Copy slip has also been included. I've seen Gotham by Gaslight twice now, once on traditional Blu-ray and the other via UltraHD, and unsurprisingly the biggest difference can be spotted in the subtle glow of the lanterns and "natural" light scattered throughout this rendering of Gotham, elevated by HDR in this 2160p presentation. Both transfers exhibit clean lines around the artwork, robust colors in fiery explosions and fluids in Bruce's laboratory, and tremendous contrast balance amid the dim alleyways and streets of a centuries-older Gotham City. This is inherently a dark film, though, and the palette constantly adjust to the brown-hued, dim appearance throughout, wrapping up details in the gloomy shadows. The 4K disc grasps at upticks in high-definition quality in the expected areas, the highpoints of radiant light and the rich lows of architecture cloaked in darkness; the glow within lamps and windows are dazzlingly radiant and stand out from the darkness, while the shadows are rich and complex without wiping out the fine details within. Color banding doesn't rear its ugly head, and the digital quality remains stable across all contours, yielding a handsome presentation of 4K artwork. The atmosphere of Victorian-era Gotham also produces a reputably array of surround components worth relishing through the DTS-HD Master Audio track. Explosions, punches, and other types of crashes deliver stable, deep lower-end response, which also spreads between the front half of the surround stage for a satisfyingly dynamic effect. The clopping of hooves, the trickle of rain, and the chatter of rustic clubs spread across the breadth of the channels, while the atmospheric music permeates the full space with nuanced, yet balanced clarity. Dialogue finds a comfortable, effortlessly clear home in the center-channel space of the track, handling inflections and the depth of myriad voices with a strong grasp on naturality, Jennifer Carpenter's restrained yet alluring delivery of Selina Kyle and Anthony Stewart Head's velvety portrayal of Alfred are particularly delightful here. No perceptible distortion emerges anywhere, and the lack of an object-based track can't really be felt, though the track tends to be light in rear-channel activity and somewhat rigid in how it travels between the fronts. 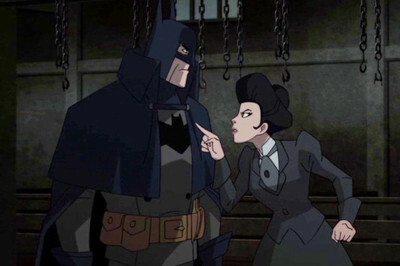 An Audio Commentary with Bruce Timm, director Sam Liu and writer Jim Krieg spearheads the extras for Batman: Gotham by Gaslight, and it's a stock and amiable track in which they explore the animation and storytelling components. They discuss capturing the 19th-century period -- staying away from steampunk elements -- and connections to Sherlock Holmes, compositing characters and books in creating the story for this animated film, how they chose their vocal talents (and how Sam Liu's fan appreciation for Dexter came into play), and the practical difficulties in keeping Jack the Ripper's face hidden throughout the film and incorporating the real person's mythos into the narrative. His identity is revealed early on and gets incorporated into the discussion, which enriches the discussion. It's a pretty standard commentary. The other key extras comes in Caped Fear: The First Elseworld (20:45, 16x9 HD), in which the DC creative team explore both the original comic book and how they adapted it into a feature-length film, as well as how they give it a "horror" keel. Interviews with Brian Augustyn (the author of the comic), creative guru Bruce Timm, and the animated film's team explore the translation of Batman-centered themes to the Victorian era, roping Mike Mignola into being the artist for the comic, flickers of German expressionism embedded in the imagery, and how Batman's detective deductions tie to the atmosphere, amounting to an enjoyable featurette. WB and DC have also included A Sneak Peek at the grindhouse-inspired Suicide Squad: Hell to Pay (8:33, 16x9 HD) animated film, a pair of other Sneak Peeks at past Batman stories, two episodes From the DC Comics Vault -- Batman: The Brave and the Bold's "Trials of the Demon!" (22:58); Batman: The Animated Series: Showdown (21:19) -- and a Trailer wing that disappointingly only includes one for Batman vs. Two Face and not one for Gotham by Gaslight. 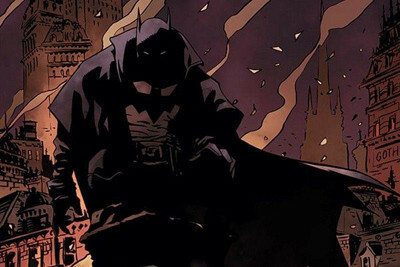 Batman: Gotham by Gaslight becomes the first direct take on the Elseworlds brand of alternate-reality storytelling for DC's animated wing, and it can also be seen as a return to form after a rash of lackluster outputs from the studio, both their graphic-novel adaptations and their new creations. 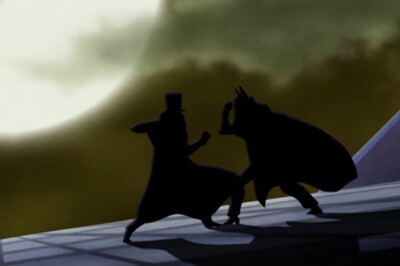 Journeying to a different time and space proves to be a welcome change for director Sami Liu and writer Jim Krieg, who utilize the "anything goes" aspects of this branch of storytelling to tell an even wilder version of Batman's investigation into the murders of Jack the Ripper in a Victorian-era Gotham. 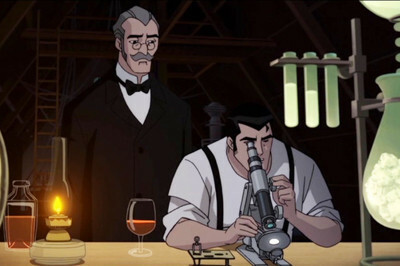 They don't really dig into the setting's atmospheric potential, merely draping earth tones, darkness, and lantern light atop Gotham while removing modern technology, and the transformations that have been made to certain characters take the concept of "the Batman universe in a different era" and distort it with surprising shifts in their modus operandi. The mystery is absorbing, though, and it's intriguing to see both Bruce Wayne and Batman tackle a different sort of villain and the antiquated themes of their villainous objectives, while also delivering strong white-knuckle animated brawls. Gotham by Gaslight looks and sounds appropriate both in 4K and standard HD, and the Blu-ray comes equipped with a decent array of extras that include a commentary, a fine featurette on adapting the novel for the DCAU, and some other goodies. Mildly Recommended.